The well-known phrase "the gift that keeps on giving" has been used in many commercials since the early 20th century. It's a snappy line that has been used to sell gifts for holidays such as Christmas, Father's Day and Mother's Day. What is The Gift that Keeps on Giving? The "gift that keeps on giving" is meant to continually invoke the feelings people get when they receive a present. It implies that any present that gives enjoyment over and over, such as a radio, camera, or a magazine subscription, would be better than a gift that only provides that feeling once, like a bouquet of flowers. The phrase was especially popular with electronics companies and some of the most well-known commercials using the phrase include the following examples. "When you go to your Victor Dealer's to hear the three models of Victor-Radio, you will find them beautiful, compact, and soundly built, as become Victor instruments. You will recognize them as the gift that keeps on giving...a royal gift...at a very low price!" During the 1928 Christmas season, Hotpoint ran ads saying, "Give Mother what she really wants this season, this all-white Hotpoint electric range. A gift that keeps on giving!" The ad goes on to feature Hotpoint's latest appliances for the season as well. An advertisement in 1948 for a Du Mont Sherwood Model television featuring AM/FM radio and shortwave radio displays the slogan " The gift that keeps on giving..." at the beginning of the ad. This campaign was run during the Christmas season and encouraged consumers to make their purchase early so their new television can be installed before Christmas Eve. In 1963, RCA Victor ran a magazine advertising campaign featuring the slogan "The Gift That Keeps On Giving." The advertisement was for the Christmas season and was to promote color televisions. The ad said "Stamp it with special care this Christmas! Give the gift that keeps on giving" from RCA Victor." Kodak Camera ran ads in 1977 as part of their Christmas advertising. The ad for Kodak's Trimline Instamatic 18 Camera used the line "The gift that keeps on giving picture after picture" as part of its campaign. Throughout the years, Kodak used the tag line, "The gift that keeps on giving," in many of their ads and the slogan is perhaps most commonly associated with their products. In 2016, chocolatier Godiva came up with a catchy spin on this slogan with its commercial campaign: The Box That Keeps on Giving. This campaign promoted Godiva's holiday box containing four boxes of luxury chocolates. The gift box was filled with chocolate gifts nestled inside one another. The slogan encourages the recipient to enjoy a box and share a box with someone who deserves a delicious holiday treat. In addition to the above commercials and campaigns, the tagline "the gift that keeps on giving" has become so popular it been used to advertise many things over the years. You will find this slogan used to sell jewelry, gift cards, and magazine and gift-of-the-month subscriptions. It has also been used to sell male enhancement drugs and in a parody way to warn of the dangers of STDs! The phrase is even referenced in songs and movies. Whatever product the advertiser thinks will please consumers and keep on making them happy often gets labeled as a "gift that keep on giving." "What Commercial Said “The Gift that Keeps on Giving”?." YourDictionary, n.d. Web. 20 April 2019. <https://quotes.yourdictionary.com/articles/what-commercial-said-the-gift-that-keeps-on-giving.html>. 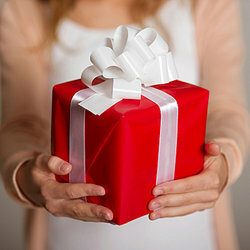 The well-known phrase “the gift that keeps on giving” has been used in many commercials since the early 20th century. It's a snappy line that has been used to sell gifts for holidays such as Christmas, Father's Day and Mother’s Day.